Israeli Prime Minister Benjamin Netanyahu says he intends to name a new settlement in the Golan Heights after US President Donald Trump. Mr Netanyahu said the move would honour Mr Trump’s recognition of Israeli sovereignty over the Golan in March. Israel seized the Golan from Syria in 1967 and annexed the territory in 1981. The move has not been recognised internationally. Syria said Mr Trump’s decision was “a blatant attack on its sovereignty”. Mr Netanyahu, who has secured a fifth term in office in the recent Israeli elections, has been on a trip to the region with his family for the week-long Passover holiday. All Israelis were deeply moved when President Trump made his historic decision to recognise Israel’s sovereignty over the Golan Heights. “I intend to bring to the government a resolution calling for a new community on the Golan Heights named after President Donald J Trump”, he said in a video message. For decades, Washington did not recognise Israel’s sovereignty over the Golan, but Mr Trump announced his plan to overturn US policy in a tweet on 21 March. Israel seized most of the Golan Heights from Syria in the closing stages of the 1967 Middle East war, and thwarted a Syrian attempt to retake the region during the 1973 war. In 1981, Israel’s parliament passed legislation applying Israeli “law, jurisdiction, and administration” to the Golan, in effect annexing the territory. 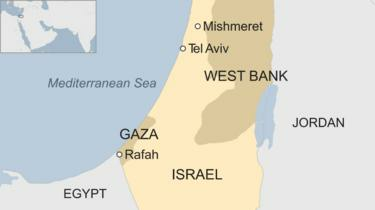 But the international community did not recognise the move and maintained that the Golan was occupied Syrian territory. UN Security Council Resolution 497 declared the Israeli decision “null and void and without international legal effect”. Three years ago, when former US President Barack Obama was in office, the US voted in favour of a Security Council statement expressing deep concern that Mr Netanyahu had declared Israel would never relinquish the Golan. 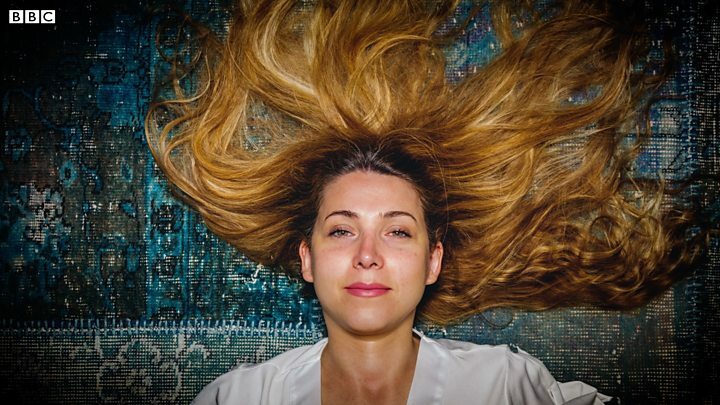 A woman from the United Arab Emirates (UAE) who was seriously injured in a traffic accident in 1991 has made a seemingly miraculous recovery after emerging from a 27-year-long coma. Prolonged disorders of consciousness are usually caused by a sudden brain injury. Munira Abdulla, who was aged 32 at the time of the accident, suffered a severe brain injury after the car she was travelling in collided with a bus on the way to pick up her son from school. Omar Webair, who was then four, was sitting in the back of the vehicle with her, but was left unscathed as his mother cradled him in her arms just before the accident. Ms Abdulla – who was being driven by her brother-in-law – was left seriously injured, but last year regained consciousness in a German hospital. Omar has opened up about the accident and about his mother’s progress following years of treatment in an interview with the UAE-based newspaper The National. “I never gave up on her because I always had a feeling that one day she would wake up,” Omar told the newspaper on Monday. “The reason I shared her story is to tell people not to lose hope on their loved ones; don’t consider them dead when they are in such a state,” he added. He was unharmed, suffering just a bruise to the head, but his mother was left untreated for hours. Ms Abdulla was eventually taken to hospital, and later transferred to London. There, she was declared to be in a vegetative state – unresponsive, but able to sense pain – The National reports. She was then returned to Al Ain, a city in the UAE on the border with Oman where she lived, and moved to various medical facilities according to insurance requirements. She remained there for a few years, fed through a tube and kept alive. She underwent physiotherapy to ensure her muscles would not weaken through lack of movement. In 2017, the family was offered a grant by the Crown Prince Court, a government body in Abu Dhabi, for Ms Abdulla to be transferred to Germany. There, she underwent a number of surgeries to correct her severely shortened arm and leg muscles, and she was given medication to improve her state, including her wakefulness. A year later, her son was involved in an argument in her hospital room, which seemed to prompt his mother to stir. “There was a misunderstanding in the hospital room and she sensed I was at risk, which caused her a shock,” Omar said. “She was making strange sounds and I kept calling the doctors to examine her, they said everything was normal. “Then, three days later, I woke up to the sound of someone calling my name. She became more responsive, and can now feel pain and have some conversations. She has returned to Abu Dhabi, where she is undergoing physiotherapy and further rehabilitation – mainly to improve her posture when sitting and prevent muscles from contracting. There are only a few cases of people recovering consciousness after several years – and even then, recovery can be protracted. It is impossible to predict the chances of someone in a state of impaired consciousness improving, says the UK’s National Health Service. People who do regain consciousness often have severe disabilities caused by damage to their brain. One notable recovery case is that of Terry Wallis, an American man who was involved in a car accident when he was 19, and made a dramatic recovery after spending 19 years in a near-vegetative state. It was thought he had been able to re-grow brain tissue. 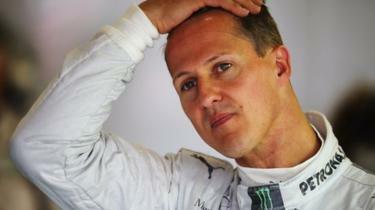 Former Formula 1 racing world champion Michael Schumacher suffered a head injury in a skiing accident in France in 2013. He was placed in a medically induced coma for six months before being transferred to his home in Switzerland to continue his treatment. 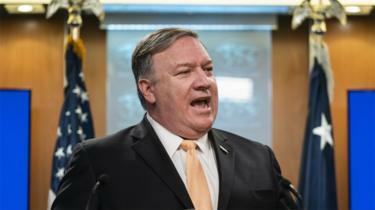 US President Donald Trump has decided to end exemptions from sanctions for countries that buy oil from Iran. Islamic State militants have killed 35 Syrian pro-government forces in desert attacks in recent days, the Syrian Observatory for Human Rights says. The UK-based monitoring group says the militants attacked in Homs and Deir al-Zour provinces. 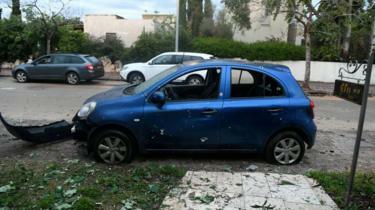 IS media has spoken about the alleged attacks, but Syrian officials have not confirmed them. It comes weeks after reports some IS militants had fled into the desert from Baghuz – their last stronghold. Although the declaration marked the last territorial victory over the group’s caliphate, experts warn it does not mean the end of IS or its ideology. Thousands of fighters and their families captured from Baghuz, including foreign nationals, remain in camps nearby. Arabic’s Feras Kilani says that losing their last stronghold is unlikely to be the end of Islamic State. The Syrian Observatory for Human Rights say IS militants have killed 27 government troops and allied militia in the desert in the east of Homs province since Thursday. Another eight were killed in the province of Deir al-Zour on Thursday night, the monitor reports. 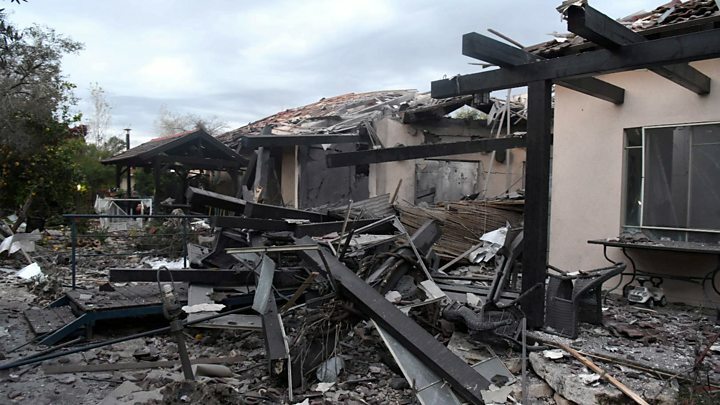 Observatory chief Rami Abdel Rahman described it as the “biggest attack and the highest death toll among regime forces since the caliphate was declared defeated”. 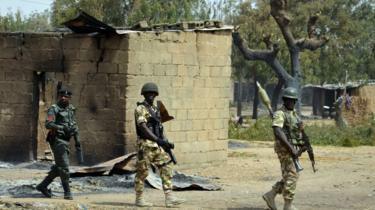 At least six IS militants were also killed in the clashes, the monitor says. The IS group’s news outlet, Amaq, allege its militants were able to seize army weapons during the Homs clashes, including a number of armoured vehicles and machine guns. The jihadist group announces the creation of the Islamic State of Iraq (ISI) and in April 2010, Abu Bakr al-Baghdadi becomes its leader. The Islamic State of Iraq (ISI) begins seizing control of territory in Syria, including the city of Raqqa. In April that year, al-Baghdadi changes his group’s name to Islamic State in Iraq and the Levant (Isil or Isis). Isis conquers over a dozen Iraqi cities and towns like Mosul and Tikrit, and seizes Syria’s largest oilfield in the Homs province. On 29 June, the jihadist group formally declares the creation of a caliphate and becomes known as Islamic State (IS). IS fighters begin killing and enslaving thousands from the Yazidi religious minority in northern Iraq and release the first of several videos of Western hostages – journalists and aid workers – being beheaded. The US begins air strikes, starting with attacks on the de-facto IS capital of Raqqa. 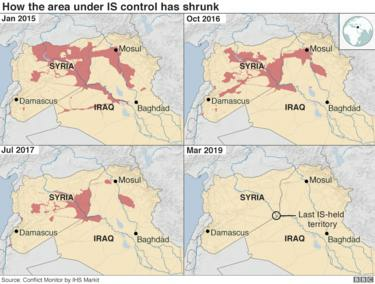 IS is at the height of its control, ruling over almost eight million people across 88,000 sq km (34,000 sq miles) from western Syria to eastern Iraq. It is also generating billions of dollars from oil, extortion, robbery and kidnapping. The Syrian government recaptures the ancient city of Palmyra, but loses it again in December 2016 and then finally recaptures the destroyed Unesco World Heritage site in March 2017. Iraqi forces liberate Mosul, but the 10-month battle leaves thousands of civilians dead, more than 800,000 displaced and much of Iraq’s second city destroyed. IS loses control of Raqqa to the Kurdish-led Syrian Democratic Forces (SDF) alliance, ending three years of rule. Iraq’s government declares victory over IS after retaking full control of the Iraqi-Syrian border. US President Donald Trump says the jihadist group is close to being defeated after a battle for the final IS-held territory on the Syrian-Iraqi border lasted weeks. The US-backed Syrian Democratic Forces says the Islamic State’s five-year “caliphate” is over after the militants were defeated in Syria. Despite the loss of territory, the group is still seen as a major security threat capable of mounting attacks in the region and worldwide. Walking across Cairo, you can’t miss the huge banners calling on Egyptians to support constitutional amendments that would keep President Abdul Fattah al-Sisi in power until 2030.
they were approved by a sweeping Egyptians began voting on Saturday in a three-day referendum on the proposed changes, a few days after majority inside parliament. “Say yes to stability and security,” reads one banner in central Cairo. The new amendments will extend the presidential term from four to six years, and the president can only be re-elected once. But Mr Sisi is being given special treatment. Not only will his current term be extended to six years, but he will be allowed to run for a third term as an exception. The military-backed president, who took office in 2014, was originally meant to leave in 2022 after his second term expires. We are rebuilding through these so-called amendments the state of the single ruler,” says Khaled Dawood, a liberal opposition figure. He believes Egypt will go back to “square one, the same autocratic rule it experienced before the 2011 revolution”. The changes will give President Sisi tight control over the judiciary, with powers to appoint the prosecutor general and all high level judges. “This ends the hopes of millions of Egyptians who took to the streets in January 2011, wishing to have a rotation of power and a president who can be held accountable,” Mr Khaled adds. Mr Sisi has not issued any statements regarding the amendments or the referendum. The speaker of the parliament has made it clear the proposals have been put forward by the majority bloc. But the parliament is full of the president’s loyalists, and it has been repeatedly criticised for being a rubber stamp. The president’s supporters argue he should remain in power to carry on with his economic reforms. MP Mohamed Abu Hamed believes it’s the people who have the final say. Following the 2011 revolution, Egyptians were politically very active. They queued for hours in front of the polling stations in the first presidential elections staged a year after the revolution. These elections brought Mohamed Morsi to power, the country’s first civilian president. A year later, he was overthrown by Mr Sisi, the defence minister at the time, following mass protests. Many Egyptians, today, seem to have lost a lot of their enthusiasm. “What kind of a difference would my vote make? Whether or not I take part in the referendum, these amendments will pass,” a young man, who preferred to remain anonymous, tells me. Some people are concerned about their livelihoods, more than anything else. “I haven’t heard much about these changes, but I am certain they are made for the powerful not the people,” says a middle aged lady, who also did not want to be identified. She has decided not to vote because “everything is going wrong. Prices are high and our living conditions are dire”. For a considerable number of voters, stability remains an important priority. “Look at what’s happening in the region. At least we feel safe here,” Mohamed, a man in his 50s tell me. He believes the president is investing in infrastructure by building “new bridges, tunnels and roads”. “If he leaves no-one can continue what he started,” he adds. The Sisi government takes pride in bringing back a long-missed stability. Tourism, for example, a lifeline for the economy, has benefited from the stable status quo. Official statistics show that visitors are coming back and growth rates in this vital sector are on the rise. The amendments will boost female parliamentary representation, allocating a quota of 25 per cent of seats to women. They will also introduce a second chamber to parliament, in addition to appointing one or more deputies to the president. One significant change is related to adding extra powers to the army. 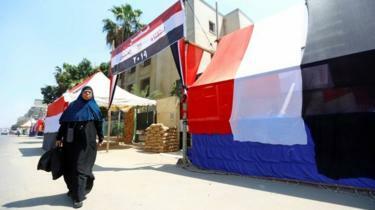 For decades, the military institution has been a key player in Egyptian politics, and economy. Now it has been appointed as “the guardian of the constitution and civil state”. Critics say this will open the doors wide for militarising the Egyptian state. 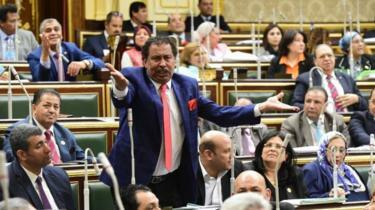 But MP Abu Hamed says the army had sided with the people to unseat Hosni Mubarak in 2011, and to oust Mr Morsi in 2013. He believes this change is “not inventing a new reality, it is just legitimising it. The army always acts upon people’s wishes”. Opponents say the authorities are leaving them no room to hold any public campaign against the amendments. “Members of our parties are arrested, and we are banned from all local media,” Khaled Dawood says. Meanwhile, Netblock – an NGO that monitors cyber security – says internet providers in Egypt are blocking access to an estimated 34,000 internet domains “in an apparent bid to stamp out an opposition campaign under the slogan Void”. The monitoring group says the campaign’s website was blocked after it had reportedly gathered 60,000 signatures in a few hours. Hundreds of news websites, which the authorities accuse of supporting terrorism, have been already blocked in Egypt over the past year. “There is no press, no media, nothing but the government voice,” says Mokhtar Mounir, a human rights lawyer, who paints a very grim picture of Mr Sisi’s rule. “We have a huge number of political prisoners, people dying of medical neglect behind bars, and women sent to prison for trivial charges,” he adds. The president has repeatedly said there are no prisoners of conscience in Egypt, insisting on the independence of the judiciary. 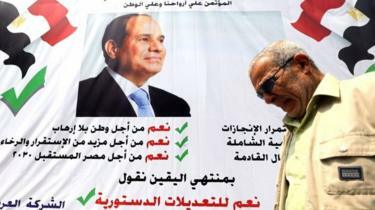 For now, things are apparently calm and it’s up to the Egyptian voters to decide. But the concern is if President Sisi tightens his grip on power further, public anger could erupt as it did less than a decade ago. Israelis are voting in the country’s most closely-fought general election in years. Prime Minister Benjamin Netanyahu, leader of the right-wing Likud Party, is seeking a fifth term in office. But he is facing corruption allegations and a strong challenge from retired general Benny Gantz. Mr Gantz, head of the centrist Blue and White alliance, is challenging Mr Netanyahu on the key issue of security and is promising cleaner politics. As soon as the results start coming in at 22:00 (19:00 GMT) on Tuesday, negotiations start on the formation of a governing coalition. Final pre-election polls suggested the two main contenders were neck-and-neck, with both set to win 30 seats. 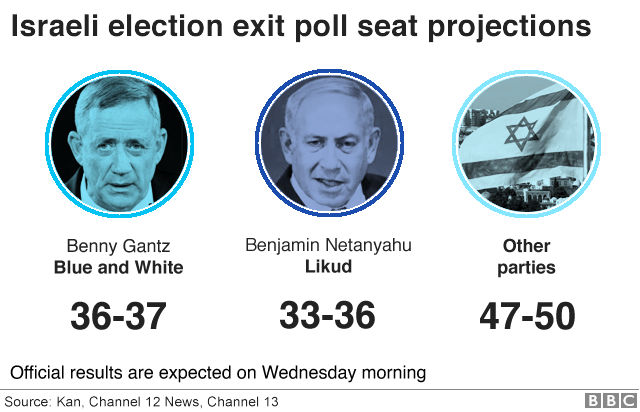 In Israel’s fragmented party system the advantage remains with Mr Netanyahu, who still looks most likely to be able to form a new coalition government, says the BBC’s Michael Johnson Bateman in Jerusalem. 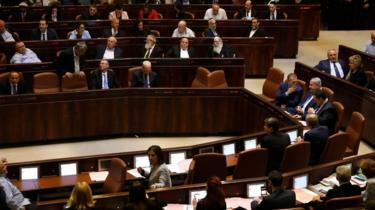 In a widely criticised move to lock down extra right-wing seats, Mr Netanyahu brokered a deal in February making it easier for candidates from an extreme-right wing party that many view as racist to enter parliament. What was Netanyahu’s pitch to voters? At a rally in Jerusalem on Monday, Mr Netanyahu told Likud supporters not to be “complacent” and urged them to turn out at polling stations. He warned that his “leftist” rivals could still win. Our correspondent says Mr Netanyahu has appealed to Israel’s increasingly right-wing voter base with tough messages on security and a significant announcement in the final days suggesting a new government would annex Jewish settlements, in the occupied West Bank. Our correspondent says Mr Netanyahu has faced an uncomfortable election race, dogged by looming corruption charges, and a flare-up in the conflict with Palestinian militants in the Gaza Strip. The prime minister denies the corruption allegations, and says he is a victim of a political “witch hunt” aimed at influencing the election. The former chief of staff for the Israeli military, a newcomer to politics, can rival Mr Netanyahu on security – one of the election’s key issues. He has also promised “cleaner” politics. Mr Gantz told Blue and White supporters in Tel Aviv that the prime minister wanted to change the law to protect himself from prosecution. “The whole purpose is to create a legal fortress to guarantee his legal immunity in front of the serious charges he is facing,” he said. Saudi Arabia has detained at least seven people, including two dual US-Saudi citizens and a pregnant woman, a London-based rights group says. Those arrested are not said to be frontline activists, but writers and bloggers who have discussed reform. The latest arrests come amid concern at the fate of activists already in prison after pushing for women’s rights. Ten women’s rights campaigners were put on trial last month following a crackdown beginning in 2018. Three were released last week on bail. Saudi authorities have not commented on the latest arrests. The other US-Saudi national arrested was reportedly Badr al-Ibrahim – a writer and doctor. Scrutiny of Saudi Arabia’s human rights record has intensified since the murder of journalist Jamal Khashoggi at the Saudi consulate in Istanbul last October. But the Saudi authorities deny he was involved and blame a “rogue” operation. Eleven people went on trial in January. Women’s rights in Saudi Arabia have been an enduring focus of international concern, despite some public overtures toward reform from within the kingdom. Saudi women still cannot travel, get married or open a bank account without a male guardian’s permission. The teenager eventually received UN help and has since been granted asylum in Canada. 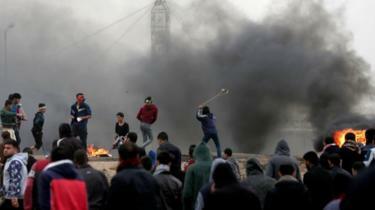 Two protesters died in the clashes, Palestinian officials say, with a third killed overnight. 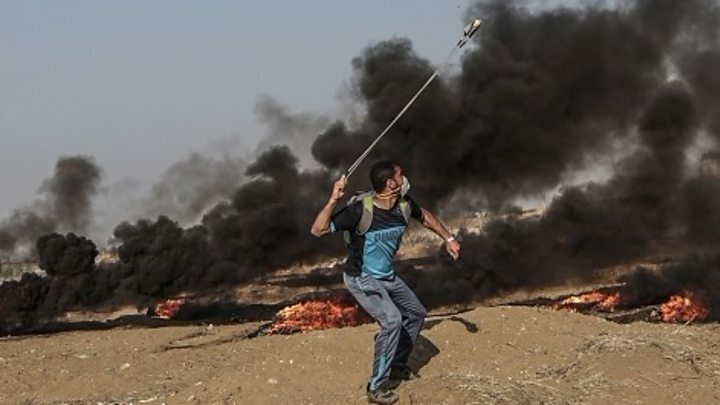 At least two Palestinian protesters, both 17-year-old boys, have been killed and dozens more have been wounded, Palestinian health officials say. After months of fighting, the jihadist group Islamic State (IS) has finally lost Baghuz, a village in eastern Syria that came to represent the final chapter in its self-styled caliphate. 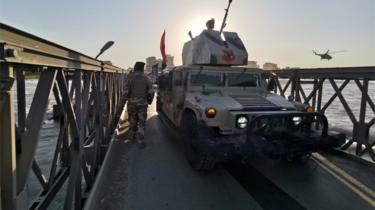 While this is a major blow, the loss of the small enclave near the Iraqi border does not spell the end of IS as a militant group capable of mounting deadly attacks worldwide. IS and its affiliates continue to be active in various countries, claiming attacks on a daily basis through the group’s online propaganda outlets. 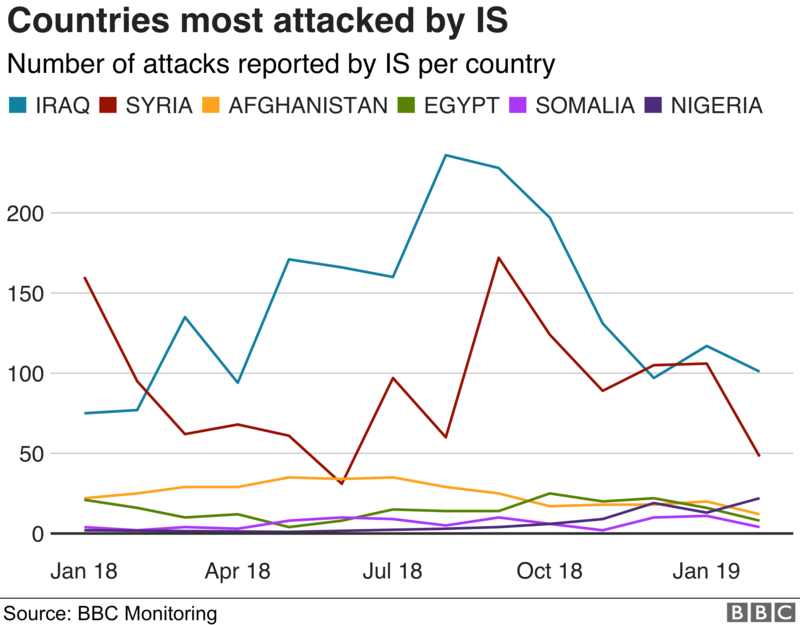 Data collected by BBC Monitoring shows that despite having lost most of its territory in Syria and Iraq at the end of 2017, IS said it was behind 3,670 attacks worldwide last year – an average of 11 attacks per day – and 502 attacks in the first two months of 2019, while Baghuz was under siege. 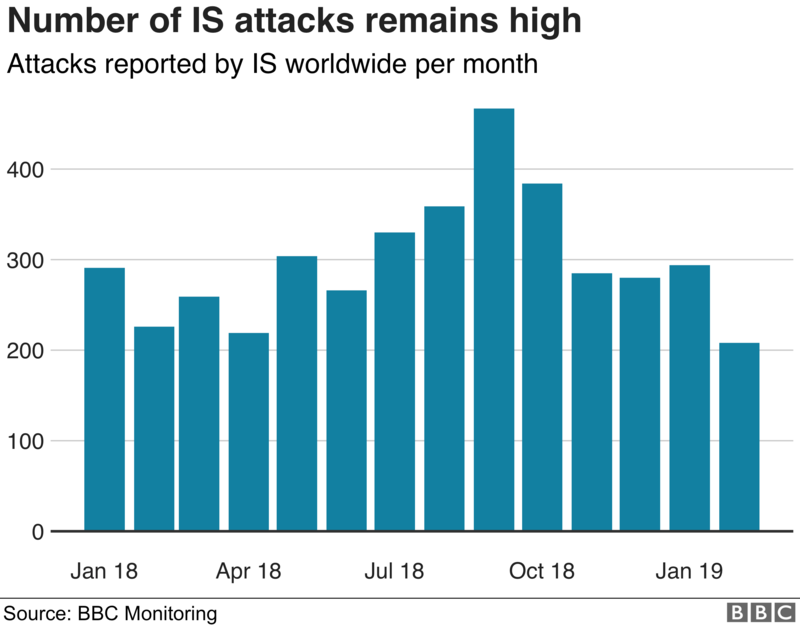 There was a peak in IS attack claims in September 2018. This was likely to have been linked to the start that month of an operation by the US-backed Syrian Democratic Forces (SDF) alliance to take the IS stronghold of Hajin, north of Baghuz. The jihadist group commonly steps up its attacks in response to offensives against it, either in the area under siege or elsewhere to divert attention or resources away from there. Although Iraq and Syria continue to account for the lion’s share of IS attack claims, Afghanistan, Somalia, the Philippines, Nigeria and Egypt’s Sinai peninsula also feature regularly. In a recent message, the IS leadership mocked US President Donald Trump’s claim in December to have defeated the group, and insisted that it was far from over. Nevertheless, IS’s caliphate model has been over since late 2017, when it lost its strongholds of Mosul in Iraq and Raqqa in Syria. After that, the group struggled to project the image of a functioning and flourishing state – which had formed the basis of its claim to have revived the caliphates of early Islam. The data is based exclusively on what the group itself has claimed through its official “Nashir News Agency” media outlets on the messaging app Telegram. The dates reflect when IS said the attacks took place, rather than when the claim was published. The data includes every claim of attack, no matter how small or inconsequential. Most attacks that IS claimed solely through its weekly newspaper al-Naba without issuing a separate statement were not reflected in the data. It is worth noting that IS, like any jihadist group, has a tendency to exaggerate the scale of its attacks and their impact. IS has officially declared that it has a presence in the following countries and regions: Iraq, Syria, Libya, Egypt, Yemen, Saudi Arabia, Algeria, “Khorasan” (the Afghanistan-Pakistan region), “the Caucasus”, “East Asia” (mostly active in the Philippines), Somalia, and “West Africa” (mostly active in Nigeria). Some of these branches, such as Algeria and Saudi Arabia, have barely claimed any activity, and others like “the Caucasus” rarely claim attacks. The group recently signalled through its propaganda an intention to step up its activity in Tunisia, a country where it has so far failed to make inroads following the 2015 attacks on a museum and beach resort that it claimed. IS also announced for the first time a presence in Burkina Faso. The announcements about Tunisia and Burkina Faso suggest that at least in terms of propaganda, IS is keen to indicate that its trademark slogan “Remaining and Expanding” still applies. 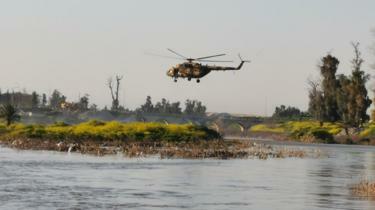 Unsurprisingly, IS’s biggest battleground continues to be in Iraq and Syria, where it clearly has its best resources. Out of a total of 3,670 attacks IS claimed worldwide in 2018, 1,767 were in Iraq (48%) and 1,124 were in Syria (31%). But last year also saw a notable increase in claimed activity by other IS branches. It was as if the group wanted to compensate for its losses in Iraq and Syria and to remind people that it also operated outside the Middle East. 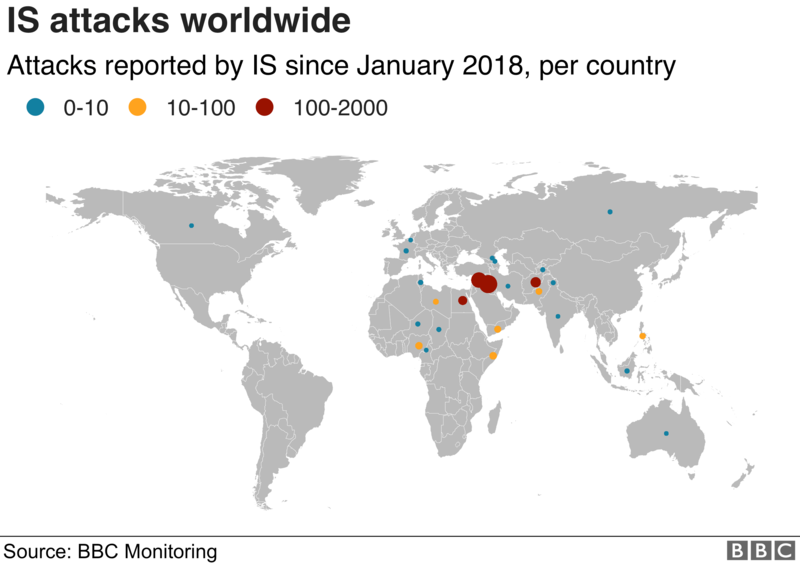 In 2018, IS claimed 316 attacks in Afghanistan, 181 in Egypt’s Sinai peninsula, 73 in Somalia, 44 in Nigeria, 41 in Yemen and 27 in the Philippines. The number of attack claims by IS West Africa Province in Nigeria has notably risen in recent months. The army has been the primary target, possibly because the group is attempting to seize weaponry and in turn boost its capability. IS has claimed 44 attacks in Nigeria in the first three months of 2019, matching the total number of attacks it claimed in a whole year in 2018. In a propaganda video released in January, IS West Africa Province called on Muslims to migrate to the region and join its branch, signalling that it was ready to receive foreign recruits. On 22 March, IS West Africa Province announced for the first time that it had a presence in Burkina Faso – a country where its rival al-Qaeda has already carried out several attacks. There has also been an uptick in the number of attack claims in the Philippines. IS operates in the country through local affiliates, most of which have been fighting to establish an independent Islamic state in the south for decades. But their attacks, mostly against the army, are still sporadic. And despite repeated calls to its supporters, IS did not claim any major attacks in the West during 2018. The previous year, it claimed four attacks in the UK, including the Manchester Arena bombing; the Barcelona attacks in Spain; and the Las Vegas shootings in the US. However, some of those claims appeared to have been opportunistic, as the group failed to provide evidence. In 2018, IS claimed seven, mostly low-profile attacks in the West that appeared to have been inspired by the group. They comprised four knife or gun attacks in France, and one attack each in Belgium, Canada and Australia. Flash floods in southern Iran have killed at least 19 people and injured at least 100 more, officials say. 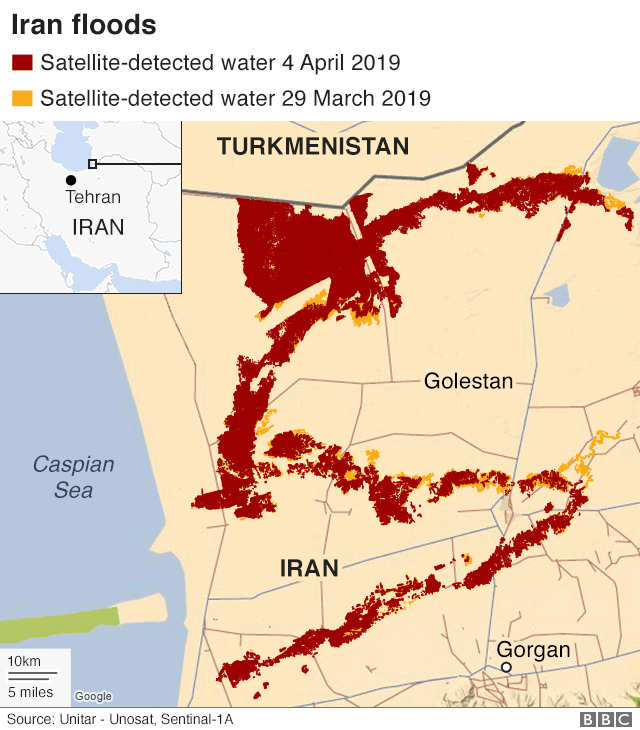 Dramatic footage on social media showed torrents of muddy water surging through the city of Shiraz where most of the deaths occurred. People were seen clinging to lamp posts and the tops of cars. Hundreds of buildings were reported damaged. Iran’s judiciary said the government’s handling of the disaster was being investigated. 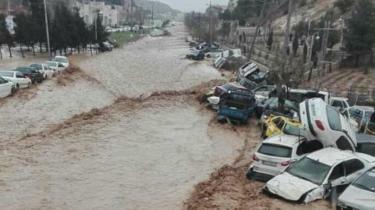 The floods struck during the Persian New Year holiday when many government offices were closed. “Any shortcomings regarding the handling of the floods, failure to provide relief and aid to the survivors will be investigated,” judiciary chief Ebrahim Raisi was quoted as saying by the Mizan news agency. 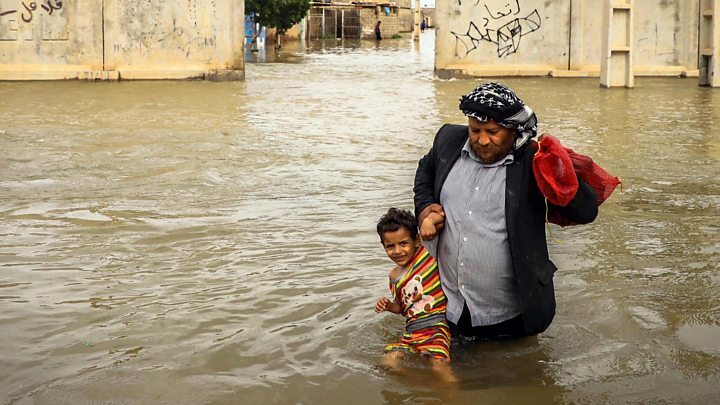 The governor of Fars province, Enayatollah Rahimi, said the flooding was now under control and rescue teams had been deployed to the worst-hit areas. Further torrential rain has been forecast for the north and east of the country in the coming hours and days. 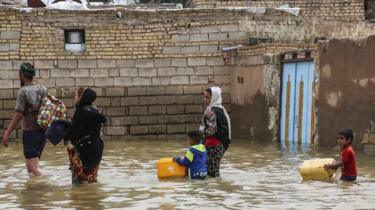 Flood warnings have been issued in almost all provinces, including the capital Tehran. 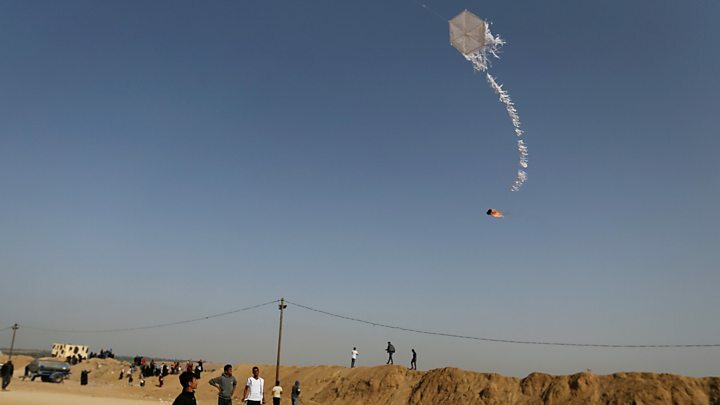 The Israel Defense Forces said the office of Hamas’s political leader and the group’s military intelligence headquarters were among the targets. The Kurdish-led Syrian Democratic Forces (SDF) says the Islamic State group’s five-year “caliphate” is over after the militants’ defeat in Syria. SDF fighters have been raising victory flags in Baghuz, the last stronghold of the jihadist group. The jihadists retain a presence in the region and are active in countries from Nigeria to the Philippines. At its height, IS controlled 88,000 sq km (34,000 sq miles) of land stretching across Syria and Iraq. 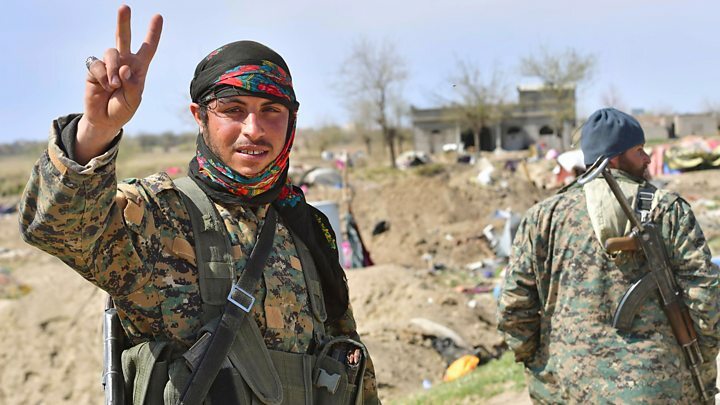 “Syrian Democratic Forces declare total elimination of so-called caliphate and 100% territorial defeat of Isis [the IS group],” Mustafa Bali, the head of the SDF media office, tweeted on Saturday. Confirming the victory, SDF General Mazloum Kobani said the forces would continue operations against IS sleeper cells, which he said were “a great threat to our region and the whole world”. He called on the Syrian government, which has vowed to retake all of the country, to recognise autonomous areas under SDF control. 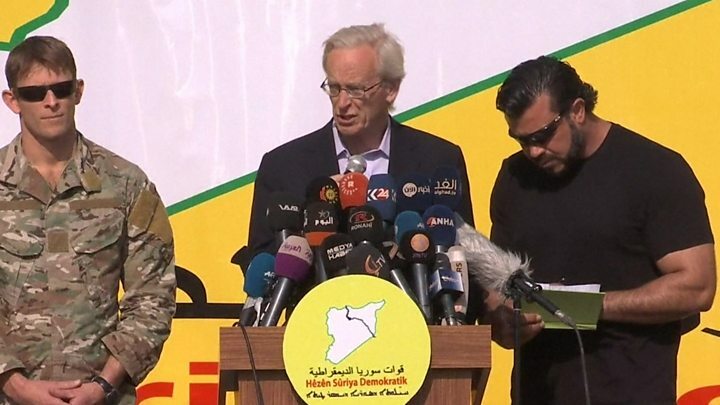 The US envoy to the coalition to defeat IS, William Roebuck, said the news was a “critical milestone”, but added that IS remains a threat “in the region, to the United States and our allies”. French President Emmanuel Macron welcomed the SDF’s announcement, saying a “major danger for our country has been eliminated”. The US-backed Syrian Democratic Forces says the Islamic State’s five-year “caliphate” is over after the militants were defeated in Syria. US President Donald Trump welcomed the fall of the Islamic State group’s five-year “caliphate”, but warned that the terror group remained a threat. 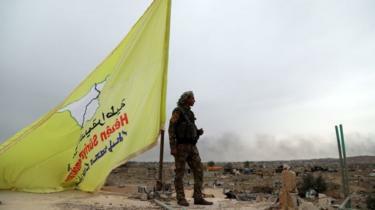 Mr Trump’s remarks came after Kurdish-led Syrian Democratic Forces (SDF) raised victory flags in the Syrian town of Baghuz, IS’s last stronghold. He said the US would “remain vigilant until [IS] is finally defeated”. “We will remain vigilant… until it is finally defeated wherever it operates,” Mr Trump said in a statement. French President Emmanuel Macron said “the threat remains and the fight against terrorist groups must continue”. UK Prime Minister Theresa May welcomed the “historic milestone” but said her government remained “committed to eradicating [IS’s] poisonous ideology”. BBC Arabic’s Feras Kilani says that losing their last stronghold is unlikely to be the end of Islamic State. “The United States will defend American interests whenever and wherever necessary,” the statement read. 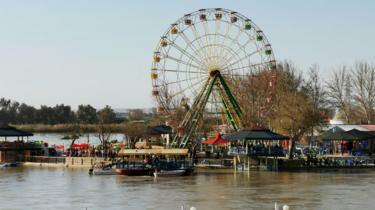 More than 80 people are reported to have died after a ferry sank in the Tigris river in Iraq’s city of Mosul. 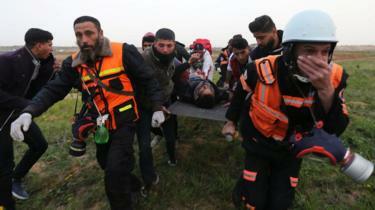 Most of the passengers on board could not swim, the head of Mosul’s civil defence agency said. Reports suggest nearly 200 people were on board. 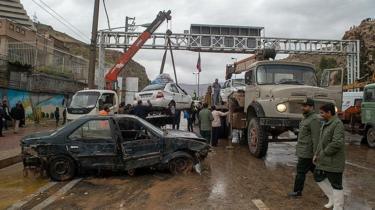 Prime Minister Adel Abdul Mahdi has ordered an investigation “to determine responsibilities”. In a statement Mr Mahdi said he was following the story “with pain and sadness”, and had ordered “all state efforts” to find survivors and treat victims. Jeanine Hennis-Plasschaert, the special representative for Iraq of the United Nations secretary general, said it was a “terrible tragedy”. “Our hearts go out to the families and relatives of the victims,” she said in a statement. The vessel was said to be on its way to Umm Rabaen island, a tourist area about 4km (2.5 miles) upstream and north of the city centre. People across the region are celebrating Nowruz, the new year festival. Mosul was captured by the Islamic State group in June 2014 and became its de-facto capital. About 1,500 children are held in detention in Iraq and the country’s Kurdish-run areas for alleged links to Islamic State, Human Rights Watch says. In a report, it says the suspects are often arbitrarily arrested and tortured to force confessions. HRW urges the Iraqi and Kurdish authorities to amend anti-terror laws to end such detentions, saying they violate international law. Iraq and the Kurdish authorities have so far made no comment. The Kurdish government has previously rejected an HWR report which alleged that children were being tortured to confess to IS links. In January, an official said the local authorities’ policy was to “rehabilitate” such children; torture was prohibited; and children were afforded the same rights as other prisoners. What did the HRW report say? The 53-page report says that at the end of 2018 the Iraqi and Kurdish authorities were holding about 1,500 children for alleged IS links. At least 185 foreign children have been convicted on terrorism charges and sentenced to jail terms, HRW is quotes the Iraqi government as saying. “This sweeping, punitive approach is not justice, and will create lifelong negative consequences for many of these children,” said Joe Becker, children’s rights advocacy director for HRW. What cases does HRW cite? Last November, the report says, HRW interviewed 29 children held for alleged IS affiliation. It says that 19 of the suspects reported that they had been tortured, including beatings with plastic pipes, electric cables or rods. One of the children, a 17-year-old boy in Iraqi detention, said he was repeatedly suspended by his wrists for 10 minutes at a time, according to the report. It also points out that most of those interviewed said they had joined IS because of economic need, peer or family pressure. Some cited family problems or a desire to gain social status. HRW says that those Iraqi children who have been released are afraid to return home because of the stigma of IS membership and a threat of revenge attacks. The human rights group stresses that international law recognises children recruited by armed groups primarily as victims who should be rehabilitated and reintegrated into society.